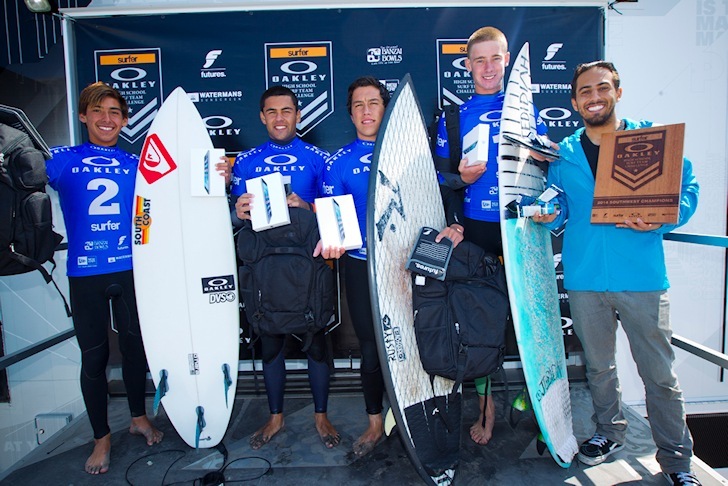 Point Loma High School has conquered the San Diego stage of the 2014 Oakley High School Surf Team Challenge, held at Seaside Reef in Cardiff, California. Ten teams of four surfers each from area high schools competed in the fun rippable swell on offer. But at the close of the final, only one team could claim the honor of best San Diego area High School Surf Team and this year’s honor went to Point Loma High School. In addition to the glory and bragging rights, the team took home gadgets, fins and sunscreen for their efforts. Carlsbad High School took second, San Dieguito Academy took third and Santa Fe Christian High School claimed fourth. A second Oakley High School Surf Team event will take place at 54th/56th Street in Newport Beach, on May 31st, to determine the top high school in Orange County.